Beach Day October found us back in beautiful San Francisco. We were joined once again by our friends Robin and Kenny. We left later in the afternoon, but we've discovered the fog tends to burn off in the afternoon, so the views are spectacular. Lunch in North Beach and then to Baker Beach to "touch" the water. We didn't spend much time there. It was much colder than usual, and the surf was bigger and white caps much more prevalent. We had a mission this trip, and although we started late, we accomplished our goal. We walked the span of the Golden Gate Bridge. It was the photographer's "Golden Hour" when we first started our trek and these are the times I wish I had my "real" camera with me instead of just my iPhone. Needless to say, I had to stop several times to take shots. There was just too much to take in and witness. The view was fantastic and the lighting was extraordinary. As it got darker, we walked faster and faster. 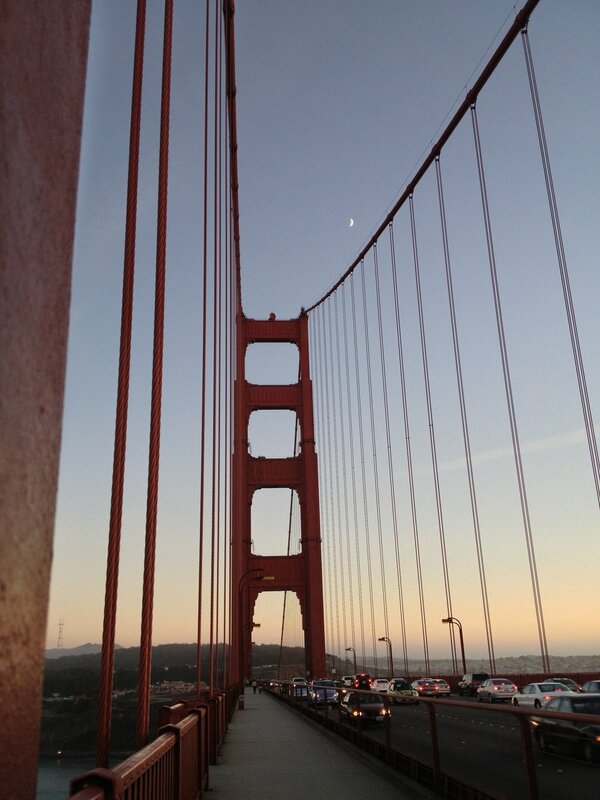 I have to admit that for a while, all I could think about was finding the bathroom on the Marin side of the bridge. Our walk back was straight through but we could see the lights of The City the entire time. What was bathed in golden light as our trek began was now twinkling against a velvet-black backdrop. I can't believe it has taken me 44 years to experience this, but I will tell you that it won't be my last time.